Every modern woman want to look good at every moment of the day. This isn’t possible with normal make-up. Permanent make-up though. 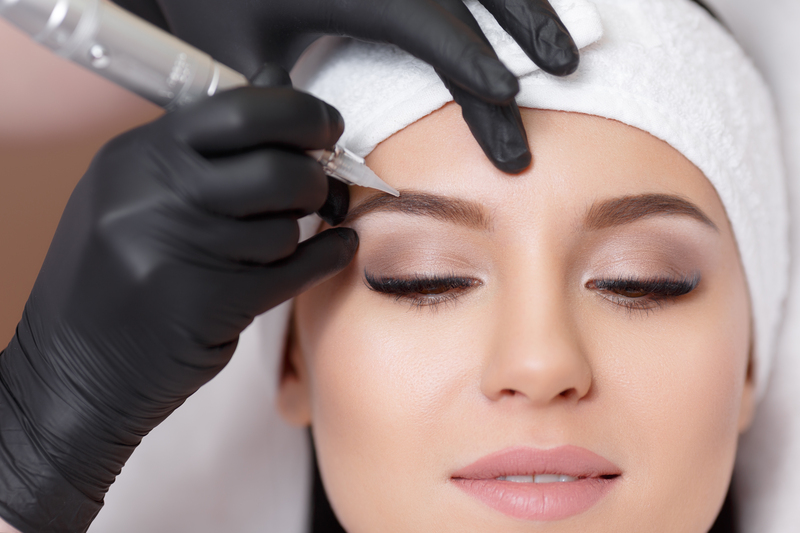 With permanent make-up eye-liners, lip liners or eyebrows are applied permanently. During sports, when you come of the sea of the pool on holiday, when you get out of bed, in all types of weather and even if you get a bit tearful during a romantic film – permanent make-up always stays put. Look good in the morning, the afternoon and the evening. Even when all normal make-up has been removed, you face is never “bare”, because the applied accents make your face expressive. You will also save a lot of time because you won’t have to apply make-up every day. How is permanent make-up applied? Permanent make-up is applied using a very think needle with goes up and down very fast. It applies a special skin-friendly pigmentation liquid. The aim is to apply the right colour in the right place so that you look your best. To apply permanent make-up accurately, expertise and reliable equipment are an absolute necessity. It’s needless to say that it’s important that the pigmentation is applied in an expert manner. In this aspect you are in good hands at your specialist. Your specialist has been trained at Ecuri Cosmetics, the leading brand in the world of permanent make-up. You specialist has completed an intensive training covering all specialisations. Your specialist works with a Manuel pigmentation pen, a pigmentation device which uses the latest technological advances and innovations in the field of permanent make-up. The Intelligent is computer operated which means is it accurate to a millimetre and guarantees optimal results. The computer operating system can set the needle frequency to an accuracy of 0.01 second. Adhering to strict national hygiene regulations, labour regulations and Environmental code, we use new sterile needles of every customer which will be destroyed after the treatment. Partly because of this you can rest assured that permanent make-up at your specialist is absolutely safe. Thin and/or irregular hair growth at the eyebrows can be completely corrected so that a smooth and even brow-line results. Any scars in your eyebrows can also be effectively camouflaged. If you have epilated too much in the past and now don’t have a much eyebrows left, permanent make-up can make you face completely again. Eyelids and lashes can emphasize your eyes. With permanent make-up we can use different colourings to alter and improve the look and expressiveness of your eyes. Eyeliner is applied between the lashes, resulting in a natural and full look. This way eyes which are too small or too big can brought optically into the right proportion to the face. Always beautiful eyes, without worrying about running or smudged make-up. Permanent make-up can use lip contours both to achieve a natural complement as well as an extra accent. Correcting lips to make them more symmetrical is an important application of permanent make-up. You can choose a real lip-liner in the colour of your choice, but also a less obvious liner which re-shapes the contour of your lips. In addition it is possible to give your lip-liner a shades effect or even to pigment all of your lips, so you won’t need to wear lipstick. Apart from cosmetic applications, permanent make-up is often used for medical applications. On of the most important uses is the pigmentation of the areola. After a breast reconstruction or breast-saving operation, permanent make-up can create a new and natural looking areola. In additional an existing areola can be more intensely coloured. On request we can carry out medical applications.